Editor's note: This article was contributed by Tom Murphy, a volunteer researcher on the Amesbury Carriage Museum's industrial survey team. Its publication here is part of our ongoing effort to share insights about Amesbury history through our website and email newsletter. 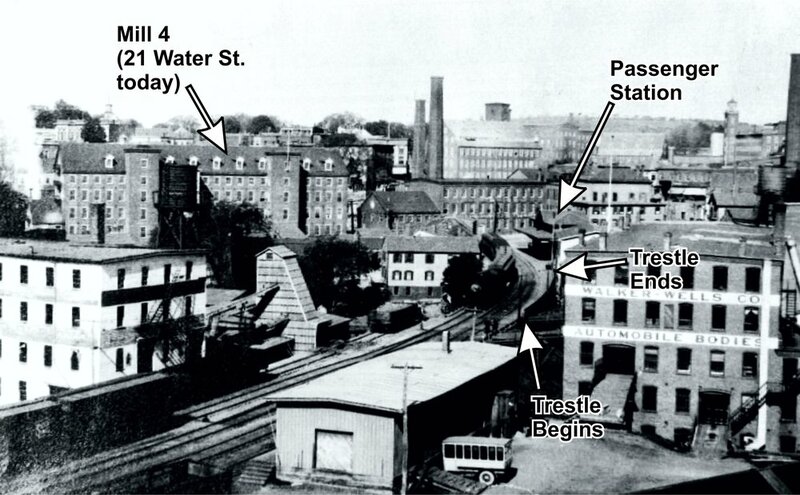 When Tom learned that the tracks for the Amesbury branch of the Boston and Maine Railroad once ended on Water Street near the back of Crave restaurant, he realized the rail bed had to pass over Back River near the Costello Transportation Center and that some type of bridge must have been there. Tom looked further into it, and here’s a report on what he found. Today's Amesbury Riverwalk follows the abandoned rail bed of the Boston and Maine until it gets to the industrial complex enclosed by Oakland and Chestnut Streets. At this point the walk deviates from the rail line to a path along the Powow River. When the railroad was active, the tracks arced past the Clark Carriage/Walker Auto Body building (still standing today on Oakland Street) and then crossed the Back River on a wooden bridge called a trestle. The approximate rail bed location is shown below as a red line on a current-day aerial photo. The line terminated at the passenger station, now Crave restaurant. The red line on a current aerial view of the Lower Millyard traces where the tracks ran originally between part of what is now the Riverwalk (the right end) and the former train passenger station (Crave, left end of the red line) [Digital Globe image]. The trestle appears on the map from 1854 below (at the time the structure was nearly 10 years old). The trestle provided the critical function of leveling the grade for the rail line and easing the work needed to carry raw materials, finished goods and people to Amesbury. There are few historical records that describe the structure. Maps, photographs and an occasional newspaper article provide some clues. An 1887 newspaper article tells about driving new pilings for the railroad. Forty years is a long time for a wooden trestle bridge to last, so it is likely that the railroad built a new trestle at this time. Clark Map from 1854 shows shows tracks running on the trestle across Back River to the original passenger station (labeled “DEPOT”) on Water Street. This station was replaced in 1880 by another depot building close to the old one. The new station (not shown on this map) is today’s Crave restaurant. Though we don’t have photographs of the trestle viewed from below, the following enlarged detail from an 1890 map gives an artist’s impression of it. 1890 Bird's Eye View (G. R. Norris) Amesbury and Salisbury Mills. Note the roof of the passenger station in the upper left-hand corner. However, we do have views from above the trestle. The photo below from 1920 shows a view across the trestle toward the passenger station and Water Street. Photo from 1920 looking west from Chestnut Street toward Water Street. A locomotive is on the trestle, and the passenger station is visible in the background. A trestle was there in 1958, and one was probably still there when the last passenger train made the trip to Amesbury in 1967. Shown below are the cut-off stubs of the pilings of the railroad trestle still visible today next to and in the Back River near the Costello Transportation Center. Remains of the wooden trestle across the Back River, viewed from the Costello Transportation Center, 2017. This short study provides some insights into the way the physical landscape of Amesbury has changed and how evidence of our history is all around us. The remains of the wooden trestle remind us of the importance of the railroad to daily life and industry in Amesbury.